"Maybe this piece is the most important. No, maybe this one is." With every armor post that I prepare, I think that we've got to be on the most important one! Each serves a critical purpose in our defense against the devil and his evil schemes, so I think my desire to have one be "most important" is silly. What stands out, is that the devil's desire to destroy us is so strong it merits all of the defenses God provides - truth, righteousness, Gospel readiness, faith, and today's focus, salvation - all at once. Only five words are offered, Take the helmet of salvation, before Paul moves on to the final piece. Few words do not mean little importance, however. When I think of salvation, I think of Old Testament proclamations that salvation belongs to/comes from the Lord, then of Jesus and John 3:16. My heartbeat quickens with meditation of the depth of love and sacrifice involved in taking man (me! you!) from darkness into the light. The Jamieson-Fausset-Brown commentary says the word take should be translated receive. By God we are handed the helmet of salvation. We receive it as a gift and we best hasten to get it on our head! Did you know that salvation in Christ is sure? Daily putting on the helmet reminds us of our sure, protected, rescued, blessed, and new relationship with the Lord. All of the commentaries were used the words assurance in reference to salvation. If you are saved, you are saved. Don't doubt it; put the helmet on! Putting on your helmet every day does not mean that you have to ask the Lord to save you repeatedly. Once you have confessed that Jesus is Lord and believed it in your heart, you belong to Him. You need not doubt. Putting on the helmet means daily embracing your salvation and living under every moment, letting it protect your vulnerable head from satan's attacks. Stott says, God's saving power is our only defense against the enemy of our souls. (p 282) Doesn't that make you want to get that helmet on quick?! As I thought about this, two things came to mind. 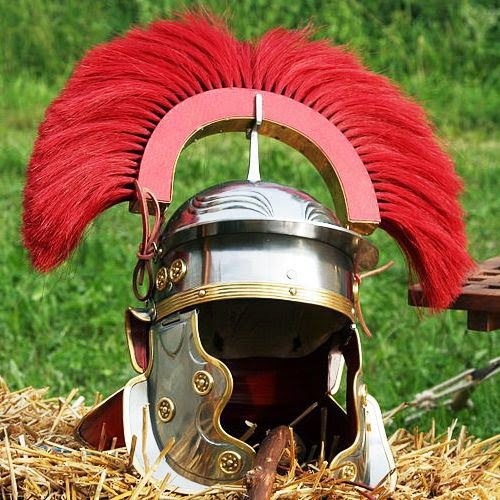 First, a conviction: What other helmets of "salvation" am I trying to put on? Do I attempt to show the evil on my good works, my lineage, my talents? Or in the face of temptation, doubt, and attack do I point to my head and say, Saved by the blood of the Lamb! You can see yourself out, satan. The second thing that came to mind is how the helmet of salvation not only protects us here, but is our ultimate defense on the day of judgement. One day each of us will stand, alone, in the presence of our Maker. If Jesus is our Savior, Lord, and Brother, we can confidently approach the throne and say, Lord, let me show you my helmet and let me praise you forever. Thank you for saving a wretch like me! Salvation is from the Lord in Christ, by grace alone through faith alone. All other ground is sinking sand, the hymn says. Take the gift of salvation freely offered in Christ! Put on that impenetrable helmet! And stand firm, today and for eternity! One more thought: there's no discussion in commentaries about whether this one is either a gift/work of God or a moral character issue. Salvation is all an only of the Lord!